The canvas was created during the artist’s creative rise. It perfectly reflects his personality at that time. In one of his first fundamental abstract canvases, the painter uses black strokes against a background of bright colors, forming disharmony. 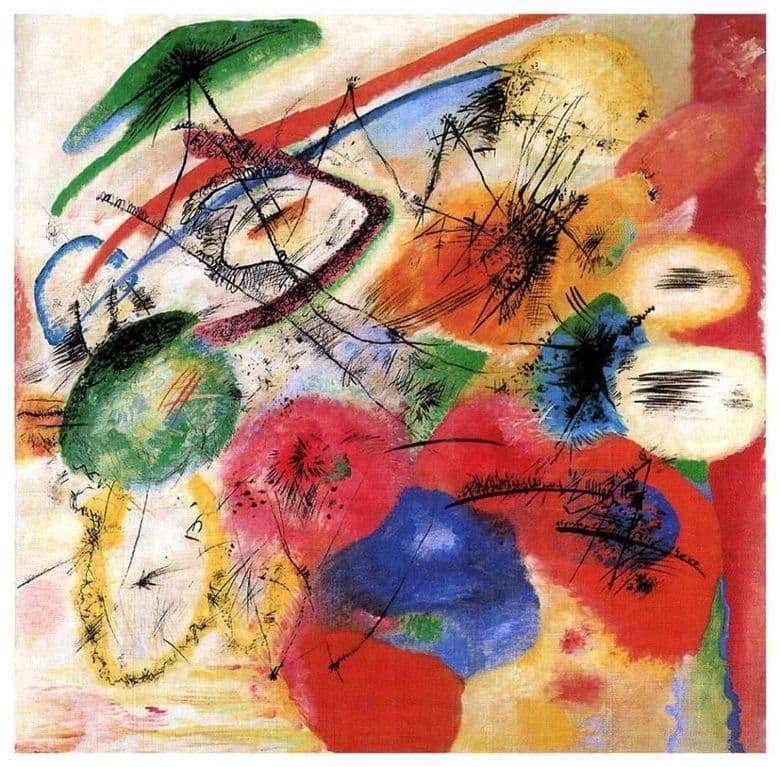 All the main colors of the spectrum and their subtlest shades fall in large strokes on the canvas, denoting bizarre rounded and curved figures, connected and incident on each other according to special laws. However, the picture is a lyrical work. The artist sets himself the task of stirring the contemplator, arouse in him a flurry of emotions, talk heart to heart with him. He was first to understand that it is important for a contemporary painter not only to display what he saw, to recreate it, to copy it, but to show it in secret, hidden from view. He founded a painting based on emotions and feelings. On canvas, the coloring in soft pastel colors creates a field that plays in shades, and expressive scenic spots do not look numb and shapeless. They froze for a moment before the new movement. Such an expressive figurative reception allows you to feel the inconstancy of life, the variability of mood. The thinnest black lines indicate the fragility and fragility of a changing reality. These weightless touches are also in the process of moving, they seem to glide smoothly on a colorful background, not mixing with it. In some places, they resemble animate creatures that resemble tiny fluffy insects, amusing themselves and enjoying the sun and a spectacular colorful environment. A system of graceful nerve strokes demonstrates a graphical two-dimensional impression, while the unstable fluttering shapes represent a variety of spatial depth. In an article about his film, Kandinsky reported that his goal was to deliver a lot of little pleasure and consolation on the canvas. Therefore, it is not necessary to engage in the search for the plot on this canvas. Like all abstract creations, he expresses the instant impressions and premonitions of the author, his personal contemplation and understanding of reality. For this reason, such moments remain in eternity and serve as a reflection of that reality, which is now distant from us by time and space, but remains in memory.